Hey guys encouraged( or didn't discourage) my son to buy this Impala something he really wanted. Seen it on Supernatural of course. So it needs a total rebuild. I don't think i've seen something so abused before but hopefully we can bring it back to its full glory. Bought the car back in early 2013. We live in Melbourne but have a block of land in the country. So the first thing build a shed to do the work. Car is now stripped and work is progressing slowly. I'm a panel beater so have the experience to do the work but its amazing how different it is to normal every day work. Anyway we've got the car totally stripped, body off the chassis, the chassis stripped and part prepared. Ive put some pictures up. I hope they work as i haven't done this before but wanted to share this with like minded people. If this works will start to update as i go along. I am sure the boys (& girls) familiar with Impala's will share the knowledge. You say it's been abused, what are the big issues (rust, damage or other)? When we started stripping her down front tyres are down to wire all front ball joints shot top arm bushes non existent and running on metal insert. The front spindles look like they have been ground down for some reason. 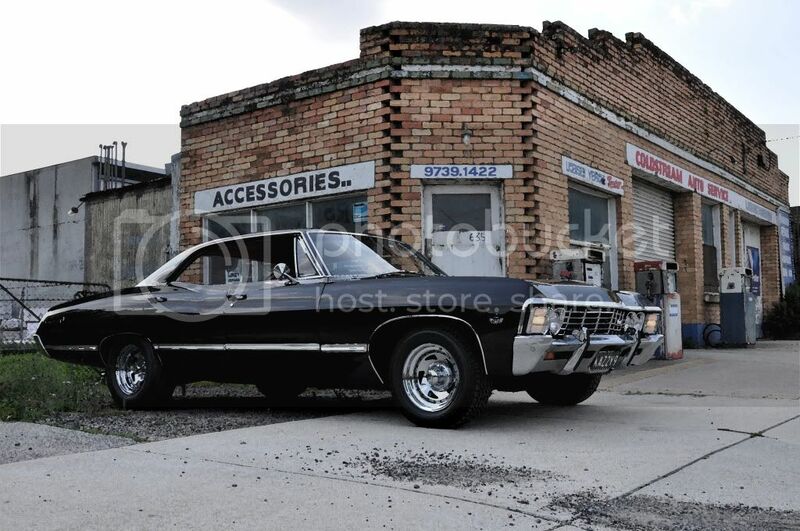 hi John (and son), didnt say if it was a US or Aussie Impala - waiting for pics..lol. Happy to help you out when needed.. in regards to Supernatural.. I am a fan - although a fan of the car first, tv show second.. but have taken it to conventions in Melbourne and met some of the cast when they were out. There are a couple of Aussie tribute cars around now. Third time lucky having trouble posting multiple pictures so i'll just do one at a time for now. This is what we bought as is. Welcome John. Your son has good taste! Welcome to the (unofficial) '67 Imp Club. Do yourself a favour and keep as many parts as you can. Quite a lot of the trim parts on the 67 Impala are not reproduced, and good used parts can cost a pretty penny. If yours is a right-hand drive model, then some parts can only be found on the RHD cars - so keep track of everything as you'll find yourself more than likely having to restore your original parts instead of buying new replacements. Regarding photos, your best bet is to open a free account at somewhere like Photobucket. Whilst you can load them directly to this site, it doesn't always work (as you've noticed), and it does eat into the site's bandwidth. If this site crashes, you lose all the photos. There's a handful of 65-68 Impala owners on this site, and all are good peoples. Any dramas, don't hesitate to ask. onya Russ, hope you and your 67 are well, I know you have been busy with your C10. John, I forgot to mention a friend of mine is selling his 67 pillarless in VIC ( currently not on carsales, but is for sale, else I would have given the link) but he also has some spare parts.. so if you let me know if you need anything and I will check if he has bits and pieces for sale. Thanks for that, The only thing i know we need at the moment is a pair of front spindles ours are shot and i haven't been able to trace any new standard height ones yet. We are concentrating on the chassis at the moment so am trying to sort out as much as possible mechanical wise. Finally got this picture thing to work. just a few progress pics. This is todays progress report. Other than parts that cn be trnsported an d worked on at home we only have sunday to work on the car s it is 100Km way from where we live. We try to do something every week, this is todays effort. The chassis is nearly ready for primer. Its good what you can do with an angle grinder and wire brush attachment. This is really budget rebuild if there is such a thing. My son Liam whose owns the car is t Uni and doesn't earn much so we will attempt to do as much as possible our selves as cheap as possible. Just to make it more interesting we have no power in the shed only a generator. We'll see how we go. Anything is possible, I say.